Overview: During a trip to the zoo, an African American girl tries to convince her mother to get her an exotic pet. ELL/ESL: ¿Me dejas tener una mascota? Ask them to predict what they would expect to see happening in the story. Show the back cover and read the copy. Ask children what they think the girl’s mother will say if she wants one of these animals for a pet. Have children predict some words they might read in the story. Give children the book and have them look at the pictures. Ask them what the pictures tell about the story. Encourage children to look at the pictures and the beginning sound of the word. The book contains familiar words: pet, monkey, tiger, zebra, bear, lion, fish. Only one word changes on each page. 1. Set a purpose by telling children to read and find out what animals the child saw and asked to have as a pet. Have children read quietly, but out loud. Each child should be reading at his or her own pace. Children should not read in chorus. Listen to children as they read by leaning close or bending down beside each child. Do they look at the pictures before they read the text or after they read? Do their eyes go up to the picture before reading the new word in the pattern? Are they saying the initial sounds of words before saying the whole word? Are they saying the individual letter sounds /p/ - /e/ - /t/ or blending the sounds? Do they reread if they come to an unfamiliar or unknown word? Have they self-corrected any mistakes? Is there any inflection or speech-like sound to their reading? Have they responded with a laugh or other sound as they read the text? Do they make comments as they read? As children read, suggest a reading strategy if they are struggling: “Try looking at the picture to make sense of the print.” Encourage children to take a guess or use the beginning letter sound. Review using the picture to help with each new word. Review using the beginning sound. Discuss the question mark and what it tells the reader. 1. Have children confirm their predictions. Ask children to explain why each of the zoo animals would not be a good pet. Reflect on what would have happened if the girl’s mother had let her take home one of the zoo animals. Have children study the picture of the mother on each page and generate some sounds she might make or words she might say. 1. Have children reread the book in a whisper voice or to a partner. This is a time for assessment. While they are reading, watch what children do and what they use from the teaching time. Alternatively, you might take a running record on one student as an assessment of the student’s reading behavior. Discuss what a pet owner has to do in order to care for a pet. Make a chart or poster that shows what needs to be done. Make a stuffed paper zoo animal and put a string or ribbon leash on it. Create a bed, food, and toy for the animal. Give the paper pet a name. Observe a small classroom pet and record what it does at different times of the day. How many different activities or actions does the class see? Make a list of reasons why the zoo animals would not make good pets. Then make a graph to show how many animals are too big, too fierce, too dangerous, and so on. An animal might be placed in more than one category. Discuss why some apartment buildings have a no pets rule. Make a list of rules an apartment building might have for pet owners if pets were allowed. Make up a story about a pet who once lived at a zoo. Children might choose a zoo animal who goes home to be a pet or a domestic animal that spends time at a zoo before going home to be pet. # ¿Me dejas tener una mascota? 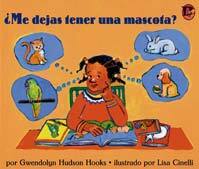 The Spanish edition also uses a patterned sentence and familiar words: mascota, mono, tigre, cebra, oso, león, pez. Because many children speak dialects or may mix Spanish and English they may use other words or variations of these words for the animal names. Help children understand that “book language” does not always match the words we use every day. The book introduction and guided reading lesson follow the outline for the English edition. Children need exactly the same support and strategy instruction as their English-speaking classmates. If children have difficulty with concepts or words in the story, see the article "Guided Reading with Emergent Readers" for suggestions.